Future Sight has been the stone cold nuts in PDC. It has contributed numerous cards that are already seeing heavy play while simultaneously allowing certain marginal decks to catapult to the status of “dang, that is a good deck.” I recently took one such deck to the winner's circle of a Euro PDC event. The deck is RG Thresher, and it is a monster. This deck is not an aggro deck- it is not RG aggro and that is one of its strengths. The deck operates by creating large monsters and then bashing for at least eight damage a turn. It runs out of a Threshold-Madness motif that allows the deck to accelerate numerous turns through efficient use of resources. Now, for something completely different- a card by card analysis! Basking Rootwalla: There are ten cards in the deck that allow this guy to get cheated into play for free. On top of that, he can sneak by control decks early defenses for upwards of six damage. Battlefield Scrounger: He can grow to a 6/6 and can recycle useful cards. On top of that, a 6/6 is bigger than everything in the format and can provide the deck a decent long game (if it ever gets that far). Gathan Raiders: He is part engine, part beater, and all man. This guy is a house, messing with combat math while eating out 25% chunks of life. He also is an outlet for extra land and Stone Rains late. On top of all of that, he is helping to reinvigorate aggro in PDC. Springing Tiger: It is a 5/5 for four. It works great with the theme of the deck and is very hard to stop in the red zone. Werebear: See above, except he also accelerates you into a turn four tiger. 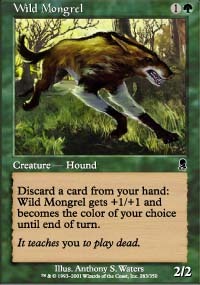 Wild Mongrel: Like the Raiders, he is part engine. He is also a savage two drop and has a huge target on his back. Which is just fine, since this deck does not win on the power of a 2/2 but rather on the backs for 4/4s and 5/5s. Fiery Temper: Three damage for three mana is not a great deal. Three damage for one mana that helps make the other cards in the deck better seems like a good deal to me. This card will often wreck combat math and keep the opponent guessing. Firebolt: He is two damage and he has Flashback. He helps apply damage while acting within the theme of the deck- of course it is a four-of. Stone Rain: Perhaps the most misunderstood card in the deck- many claim this should be Incinerate. The fact of the matter is this deck is built on the mold of Deep Dog and not RG aggro. As such, it is a Tempo deck and the rain serves to severely damage the tempo of its target. This in conjunction with the large men on your side of the table gives potential for huge tempo swings in the Rainer's favor. That, and karoos are still everywhere. 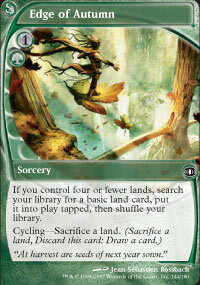 That, and you can target your own land for two cards closer to Threshold. Seriously, this card deserves to be in the deck. Edge of Autumn: Adds to Threshold by +2, draws a card, or thins the deck. Great no matter how you slice it. On top of that, this card provides flex slots for sideboarding. A strong card in the deck and a strong factor in the decks ability to compete. Lightning Axe: It kills nearly everything in the format and allows you to Madness out cards. In the late game, it just costs six. The Axe is underrated yet highly powerful in the right deck- like this one. Not much to say here, except the Snow lands are there to bluff Skred, because bluffing Skred is always a good thing. I never talk about sideboards since they are so meta dependent. However, you probably should keep in the Grudges and the Boas as they really help any match featuring Spire Golems. Ghostfire is also good beats against Guardian of the Guildpact. 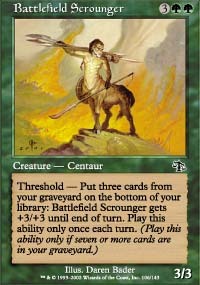 This is a big question, and for a long time, the Centaur was a Torch. However Tom and lathspel both made great observations: it does not matter if we have the Torch or not, because no matter what, they will play around it. Any person playing a deck with Mountains and a late-game plan should automatically include Torch, so we must be stupid not to run it. Except by not running it, we free up a slot or two for cards that are better suited for this deck. And yet, they still will have to play around Torch because there is no way of knowing if this deck is traditional RG Aggro or this version since they play so many similar cards and in fact, can play very similar games. In fact, on of the greatest tools this deck has is deception! I love it! Yes, this is a tempo deck. As I have mentioned, this deck is based on the Deep Dog model of strong threats, good answers, card draw, and key tempo cards. The creatures are nearly identical, only Thresher plays bigger men that eat much larger chunks of life. The answers, however, are very different. Whereas Deep Dog seeks to counter roadblocks, never letting them reach the field of battle Thresher wants to burn them off the face of the earth. This is a different style of answering threats however. Rather than wasting their resources on their turn, you are wasting their resources on your turn. Not as good, but consider this: your answers double as burn to the face- not a bad trade off if you ask me. The tempo again stems from your creature's ability to deal more damage in a shorter period of time and from the impact of the land destruction. Finally, the Edges give the deck an important card draw spell, especially when combined with cycling lands and karoos. Unlike RG Aggro, which seeks to curve out and deal damage over the course of the game, Thresher plays the Deep Dog game of sticking a lower number of threats and allowing them to win the game with a strong supporting cast of characters. However, Thresher can play the curve game and come out of the gates blazing, giving it another avenue of attack. This ability to play either the tempo game or the aggro game gives the deck a powerful tool on the path to victory: deception. So how good is this deck? Really, it is quite good. However, it needs the right metagame to to truly prosper. If the field is full of mid-range aggro, aggro-control, and control, this deck should be fine. Taking the tournament I won for example, I only ran into one true aggro deck, and lost to it once (the other time I won a hard fought finals against it). Currently, the meta is shifting away from mid-range and control to one that is dominated by board control decks (as evidenced by the rising number of MBC decks performing well recently). Can Thresher be tuned to beat these decks? Yes, as you would want more resilient creatures in the board- Jolrael's Centaur perhaps- and better card advantage cards- Solar Blast anyone? Regardless, this deck will always be on the precipice of being a solid choice- wield it wisely. Alex, that comment was from me BTW. A great article about a great format. Can't wait to see what 10th has to add. @Edge of Autumn. It is a great utility spell. R/G Does not have all of the tools that a U/G or U/W Threshold deck would have. In the worst case it fixes any mana issues you might have. In the best case it is something that allows you to dump 2 cards in your 'yard and gain a card. This deck doesn't need more than 4 mana except for the the scrounger, so its never a huge sacrifice to blow up a land. @Battlefield Scrounger. I think that 1 of is a good choice, this card is a card that will often help you to finish games. It can also help to replenish some of your resources. The trick is on how to effectively use this creature and its ability. The only thing i can gripe about is the stone rains and the Lightning Axes. The Axes are Meta dependant, meaning that if the format is filled with 4 or 5 toughness creatures its ok. But if the format is smaller then something else can be used. As far as the stone rains are concerned, i was one of the people that think that Incenerates would work better and i stand by this, but i do understand why they can be used. They help to provide good card advantage. 3 Mana is a tough slot for it though, i would be much more comfortable with a 1 or 2 cc card. This will help with being able to play multiple threats on turns 3 and 4. I never said Edge of Autumn was card advantage, or rather never meant that. It does, however, draw you a card and gives you a tempo advantage. The Centaur, as I mentioned, gets larger than anything in the format and the other cards in the deck allow you to play him as a one of- I've tested the fourth tiger, and it is not much better. Martyr of Ashes requires you to have cards in hand- this card wants card in the graveyard. It is much more liekly to have 7 cards in the graveyard than to have 3+ red cards in hand with this deck. Using the Martyr changes the plan of attack immensely, using the sandstorm does not. Excelent article and exciting deck! The way it uses edge and expanse to fuel the grave remembers much the tarmagoyf decks!!! I love it as well! Fantastic article. I love that the article was not only card-by-card descriptions, but how each card works synergistically to create something altogether different than the usual RG deck. I wish I had read this before last night as I got my buttocks [/gump voice] handed to me facing this deck in TPDC. Not sure I coulda won, but I probably would've taken the Werebears more seriously in game 1 had I known what was coming. As an aside (or ... more precisely, a request), I'd really like to read about your take on the general archetypes in PDC. How do you see the hierarchical relationships between aggro, aggro-control, true control, board control, midrange, etc.? It's a good article and a good deck, but there's some points I'd like to bring up. First, Edge of Autumn is not card draw. You're spending two cards (one if the land's not useful) to get one card. There were two card choices that kind of bugged me. The first is Battlefield Scrounger over the fourth Springing Tiger. At best, it's one more mana for +1/+1, which isn't bad, but not spectacular either. However, in the early and mid games, you'll have a hard time activating Scrounger reliably without losing threshold. The fact that it recycles cards is almost entirely irrelevant; it only marginally improves your draws and only if you play an Edge. The sideboarded Sandstorms also seem unusual. I see how they'd be used to wipe out aggro decks that overextend, but they also kill all of your creatures. Why not play something like Martyr of Sands that lets you keep your big men in play while their small creatures all die?